“Lansquenet Commander Sebastian Schertlin von Burtenbach in Armour”, c.1601, after the design by Giovanni Battista Fontana (1524–87), illustration plate from a German translation of Jacob Schrenckh von Notzing’s “Armamentarium Heroicum” (1601), published 1603/5. Woodcut, etching and engraving on laid paper with small margins lined on a conservator’s support sheet. 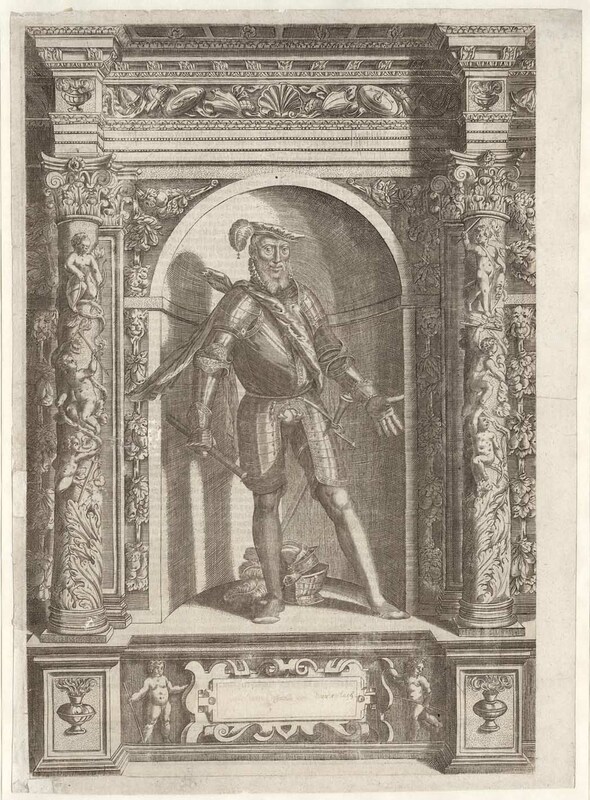 “'Augustissimorum Imperatorum ... regum... verissimae imagines..' (also known as 'Armamentarium Heroicum') is the catalogue of the arms collection Archduke Ferdinand II kept at Ambras castle; it was first published in Innsbruck in 1601. 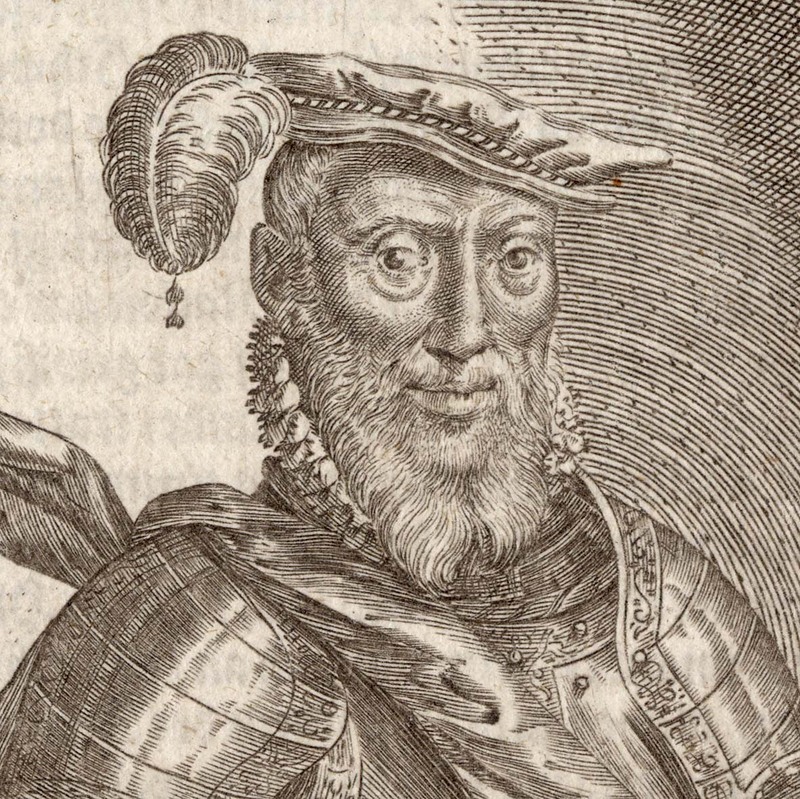 It was illustrated with a frontispiece and 125 portraits of European princes in full armour, with decorative surroundings. 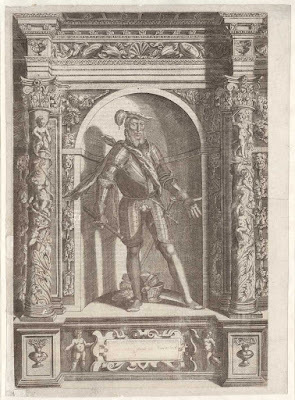 The plates were engraved by Dominicus Custos after designs by Giovanni Battista Fontana. Each plate was accompanied by a short biographical text on the former owner of the armour, written by Jacob Schrenk von Notzing. 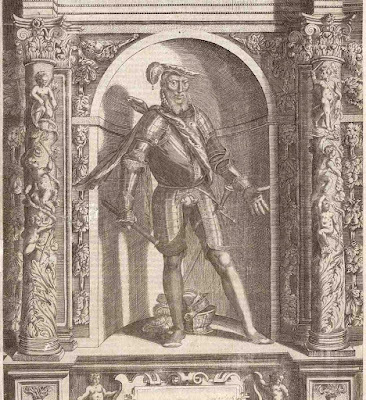 A German translation of the book (by J. E. Noyse von Campenhouten) was published in 1603 under the title 'Der aller Durchleuchtigisten und Grossmächtigen Kayser, Durchleuchtigisten unnd Großmächtigen Königen...'. Condition: slightly silvery impression with a few spots of abrasion, and restoration. The sheet has be laid onto a conservator’s support sheet. There are traces hand-written script in brown ink with the name of the portrayed luminary (Sebastian Schertlin von Burtenbach) inscribed in the blank tablet at the lower centre. The sheet is in a restored clean condition. I am selling important large print from the first museum catalogue every printed for AU$165 in total (currently US$126.63/EUR119.97/GBP101.54 at the time of posting this listing) including postage and handling to anywhere in the world. If you are interested in purchasing this historically significant print from the Renaissance era, please contact me (oz_jim@printsandprinciples.com) and I will send you a PayPal invoice to make the payment easy. This full length portrait of Sebastian Schertlin von Burtenbach, is far more than a fine example why women should never design armour protection for codpieces. After all, no man would ever choose to have sharp pointed devices around his delicate bits. 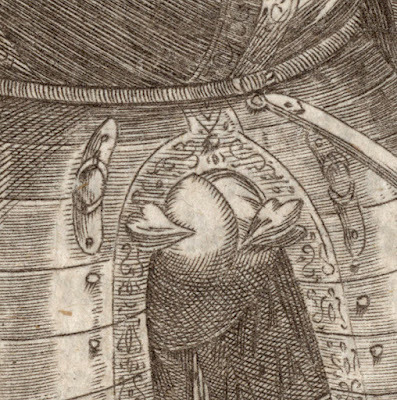 Indeed, it is part of a series of 125 engraved portraits, the "Armamentarium Heroicum", which holds the historically very significant position of being the very first museum catalogue in the world. 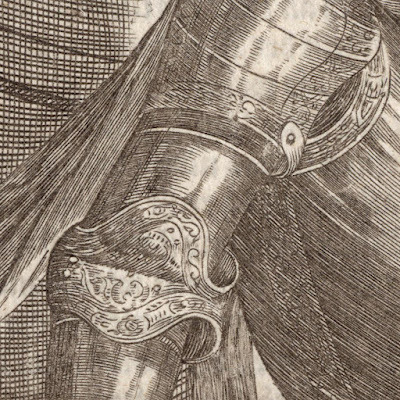 Each of the plates, like this one, showcases the armour worn by the featured luminary and the set of prints is considered to be a museum catalogue because (unless I am mistaken) all the pieces of armour were in the collection of Archduke Ferdinand II (of Tyrol) and kept in the Ambras Palace near Innsbruck. Moreover, each plate is accompanied with biographical details about the owner of the armour written by the Archduke's secretary, Jacob Schrenck von Notzing (1539–1612). Beyond being a part of the first illustrated document—a paper museum— of a collection, this print has another notable attribute that is also fascinating: according to the British Museum the prints of the “Armamentarium Heroicum” are not just engravings they are an amalgam of intaglio (etching and engraving) and relief (woodcut) printing. For those that are interested in the subject of this portrait, Schertlin von Burtenbach (1496 –1577) served under Emperor Maximilian I as a mercenary field captain until his elevation in 1532 to the rank of infantry Commander-in-Chief of the whole of the Army of the Holy Roman Empire. 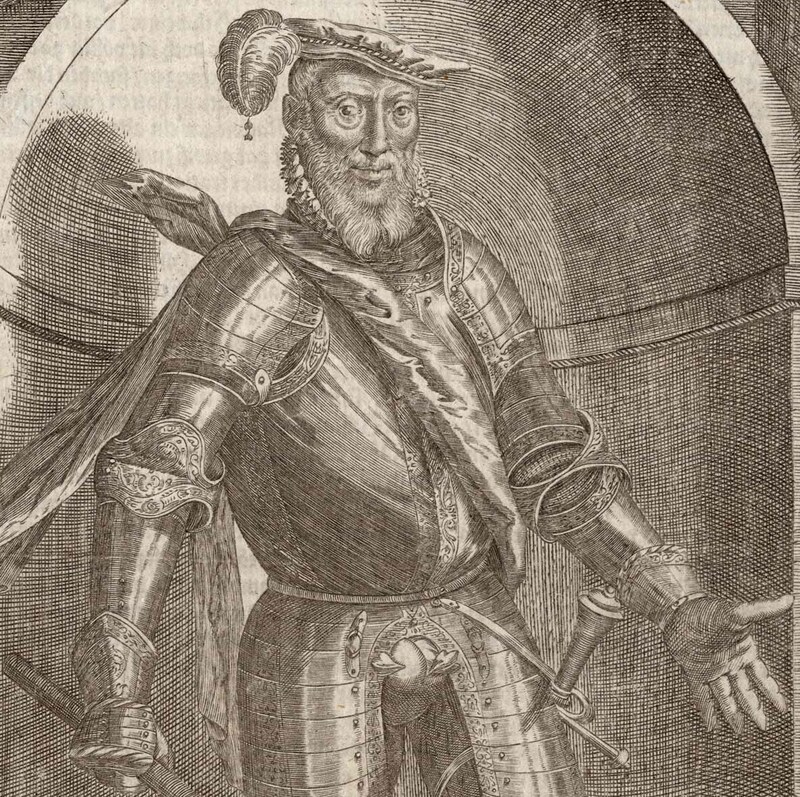 Interestingly (and I am undoubtedly wrong about this), his main role was as a “Brandschatzmeister”—the chap responsible for pillaging.